Moving in the winter has got to be the most difficult move that I can possible imagine – mainly because of parking, snow, ice, dirt, salt, lack of elevators and whipping winds. The OCD in me is terrified of salty, slushy boots tramping throughout my house. If you are planning a move during winter – here are some moving tips and hints to get you through the madness. Get Moving Help. Right now is not the time to look for bargain movers who aren’t going to protect your furniture. It may cost more initially but save you a bundle in the long run. Hiring a professional moving company is crucial this time of year. 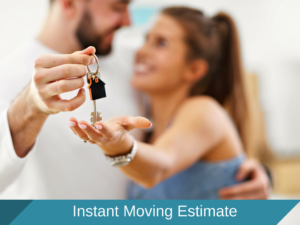 Invest in a quality move team instead of trying to do everything on your own will minimize your time in the cold, decrease your risk of frostbite or injury, and avoid the chance of a friend or family member losing their footing in rougher conditions. 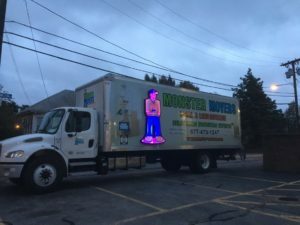 It is important to compare movers and use caution when selecting your movers by verifying their reputation for high customer service and a track record that supports it. You can do this by looking at verified moving company reviews – not on their own site but trusted sites. Keep an Eye on Weather Patterns. The temperature can change quickly in the winter. What starts rain can turn to ice within a few hours – keep salt on hand. Taking a bit of time to shovel and salt may save you a ton of money if the movers have to do this first or if they have to walk through snow to get to your door. Some cities and states do a better job of maintaining their roads in bad weather than others. For example, Massachusetts/Boston is used to extreme winter weather – it salts and plows immediately and regularly. North Carolina, however, only gets snow sparingly, so it doesn’t have the same infrastructure to handle snow and ice. Sometimes that means roads are not fully plowed or sufficiently slated. Make a Pile of Old Blankets/Towels Most movers will have moving blankets for the floors and protections for the walls but sand, salt and snow will find it’s way all over your house during a move. Wipe any wet areas down immediately to eliminate the possibility of long term damage to furniture or floors. Drying rags and cloths are helpful when walking in and out of a house or apartment. Wipe up any rain to reduce slipping hazards. You can also lay down a few cloths for people to walk on so that they don’t track in water or mud. If any of your boxes get wet, a towel is handy for drying them. Unpack Wet Boxes Immediately. Towels are a temporary solution for wet boxes. Even if your boxes dry when in the house the inside can remain wet and wet boxes that sit around for long time can start to grow mold. This problem may not be as much of a concern for easily cleanable items such as pots or pans; however, fabric objects such as your clothes may be ruined. Layer up. It’s important to dress warmly, even though you will be working hard on moving day. Consider wearing layers you can peel off as necessary. It’s better to start with too many clothes on than to deal with being cold all day. Make sure your ensemble includes a hat and warm gloves. Gas Up Your Truck Regularly. Make sure your vehicle has a full tank of gas before you put the first box in the truck. If you are moving yourself, know that fuel lines freeze in moving trucks anytime the temperature hits 30 degrees or below – there is a special fuel solution moving companies use called Iso-Heet ( there are other brands as well) that help keep your gas tank and fuel line ice free. Call A Moving Company – There is no possible way you want to do a winter move without help – it is just too dangerous. Hiring movers during the winter is imperative. Having moved in the depths of winter multiple times, I can tell you it’s something that will definatly take the winter doldrums out of you – it’s something to look forward to and who wants to spend days moving when the weather is beautiful?